Boil garbanzo beans for 5 minutes on medium heat, Drain (reserving liquid). Place garbanzo beans, sesame Tahine, lemon juice, crushed garlic, salt, and water (or liquid from garbanzo) in food processor. Blend for about 20 seconds to make a smooth and creamy dip. you can add more salt or lemon juice if desired. Also heat pignoli nuts with 2 tablespoons of olive oil and stir fry until light brown. 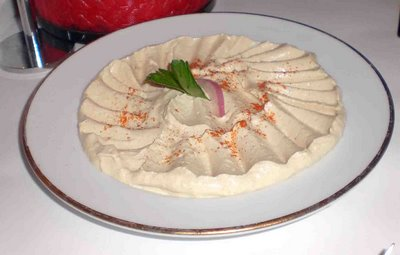 Place Hommus in a large flat serving plate and garinsh with chopped parsley, pignoli nuts, radish, and paprika. cover hommus with 2 tbs. of olive oil. Ready to serve. Hommus is best when served cold. Its great with Arabic (Pita) bread or Pita Chips.